Opportunities are the chances for making profits and sales, which your company can do. Each request of your potential customer, whether it's an e–mail letter, a completed web form on the website or an incoming call – all of them are opportunities. In the process of selling the opportunity goes through the stages that you can set up by yourself. The opportunity has the history of all activities: events (calls, meetings), invoices, files, tasks. On successful completion, an invoice is issued or a project is created (if the products/services will be delivered after the completion of the opportunity), and the opportunity is marked as won. The lost opportunities are closed with an indication of the reason for the refusal. 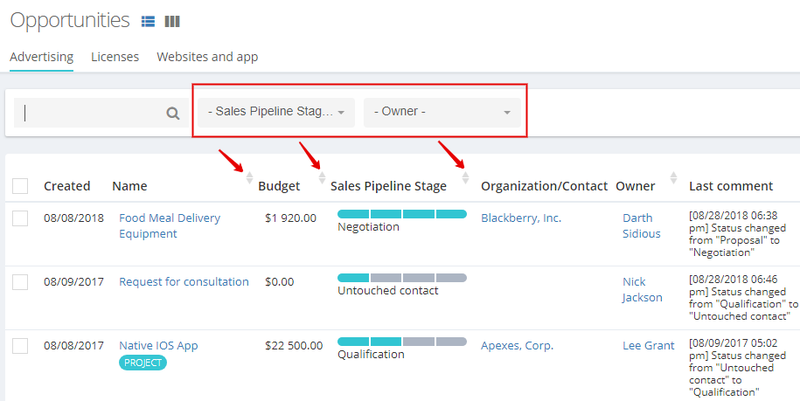 According to the statistics of lost/won deals, a report is constructed in the form of a funnel, which visually allows you to identify bottlenecks in your sales process. 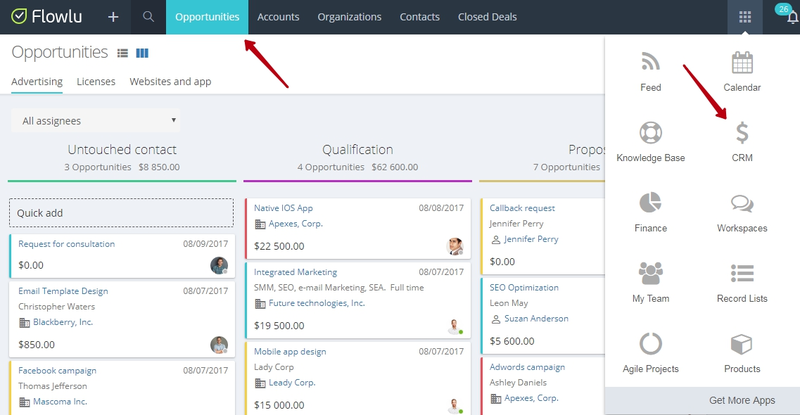 All work with opportunities is conducted in the application CRM → Opportunities. Opportunities are displayed in the form of a table. 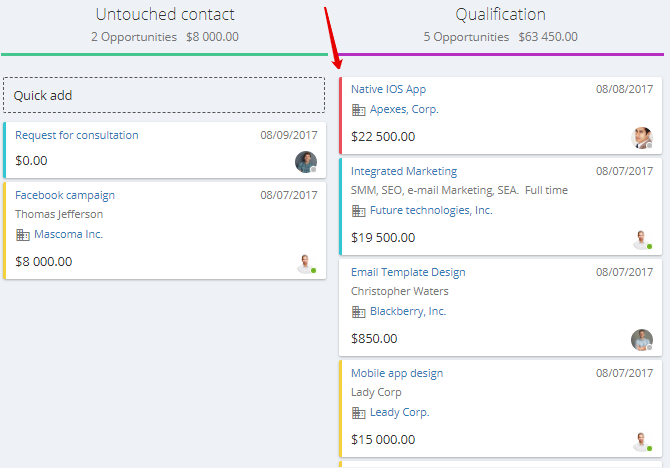 It displays the information about the stages of opportunities, the budget, the account name, person responsible for the opportunity, as well as the last comment on the opportunity. Thanks to the Opportunities board at a glance you can assess the current state of business. With the help of Drag & drop, managers drag opportunities from stage to stage as they negotiate with the client. The column under each stage shows the amount that these opportunities will bring if they are won. If you move the opportunity, the amount is immediately recalculated. Based on opportunities, the events are planned (meeting, call, e–mail) and depending on the planned date, the color indicators are displayed on the board, which prompt the manager and the department head, which deals to pay attention to. Yellow – no events are scheduled for the opportunity. Create an event on it to increase the chance to close the opportunity successfully. Red – there are overdue events in the opportunity, which urgently need to be closed. Turquoise – the opportunity has scheduled events for today and tomorrow. This will help managers not to forget about the deal during the day. No indicator – the opportunity does not require any action, it has planned events for the next days.